So, this is the challenge. What would it take to make our churches live up to the vision of fruit-filled faith? How do we become renowned for our love and joy? What will it take to establish a reputation of peace and patience? What kinds of changes do we need to make so that the first word that comes to people’s minds when they think of “church” is kindness or generosity or gentleness? What kind of training do we need to make faithfulness and self-control synonymous with church? Not all encounters work out well. But it puts it out there — my passive shirts send out signals that open the conversation — whether it goes the way I want it to or not. But, the medium is NOT the message in this case. What is required is the human contact — the opportunity to talk to the person on the receiving end. Both of the encounters cited above hit negative filters — people’s experience of church did not line up with the reason I wear the shirts. I am proud of my faith and my church. I see the shirts as outward and visible signs of deep personal realities — the potential for fruit-filled community and connection. I would love for people to share the vision and hope I feel. I am always glad people respond to the shirts, but it is always up to me to frame it in the most positive way possible. I have shared this story before, but forgive me — it illustrates my point. Year’s ago I was driving in Emerson, New Jersey and I got behind a minivan with a “Honk If You Love Jesus” bumper sticker. I was in a playful mood, so I pulled up behind the vehicle and tooted my horn. The guy driving it looked in his rear view mirror and I waved with a smile on my face. We moved up to the next traffic light, and I did it again. I honked my horn behind him at each traffic stop for the next four or five blocks. He kept looking in his mirror and I kept tooting, until he finally slammed on his brakes, jumped out of the car and gestured at me with the middle finger of both hands (must have been his wife’s car…). This guy was probably a nice guy — I have nothing to judge him on but his bumper sticker and his behavior. But isn’t that what most people have to judge us on, at least at first? Whether we like it or not, we are guilty by association. To the extent that our Christian faith is a consistent witness to love, joy, peace, patience, kindness, generosity, faithfulness, and self-control (not to mention mercy, compassion, grace, civility and respect, etc.) our T-shirts, bumper stickers, window decals, cross necklaces, and WWJD wristbands are a powerful witness. But they are equally powerful when we fail to live the fruit-filled faithful life. By our fruit, we will be known. 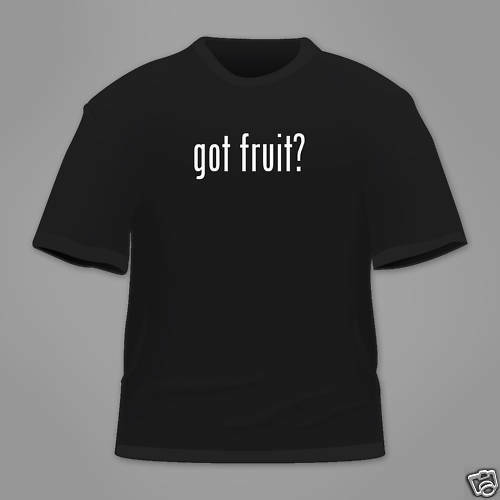 I long for a day when wearing my “Got Fruit?” T-shirt will make people nod and smile with approval because it will trigger in their hearts and minds wonderful memories of how they came to know love, joy, peace, patience etc., etc., through Christian community.